The Midtown development on the corner of Northbourne and Macarthur Avenues in Turner. Image: Supplied. 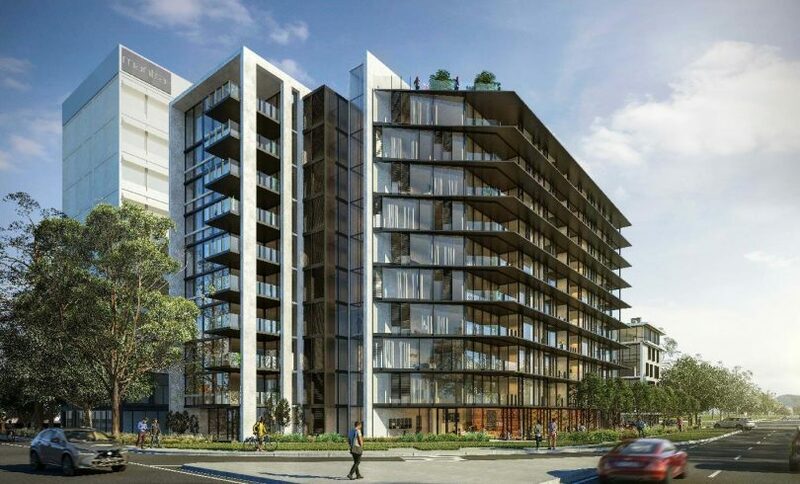 A $10 million mixed-use development that aims to be a landmark building on a key Northbourne corridor intersection has been approved by the planning authority, subject to a range of conditions. The third stage of HTI Group’s Midtown development will see a 10-storey building go up on the corner of Northbourne Avenue and Macarthur Avenue in Turner, with six commercial ground floor tenancies and nine storeys of 81 two and three-bedroom apartments crowned by a rooftop garden. Below ground will be a three-level basement car park. The notice of decision says the development will promote an efficient and sustainable urban environment and enhance employment and recreation opportunities in the area, with the commercial tenancies contributing to an active public realm. Its landscaping will also enhance the environmental amenity and, with bicycle spaces and proximity to a light rail stop, the development will promote active living and travel. But there are a substantial number of conditions ranging from parking and tree planting to reviewing traffic studies and satisfying Icon Water requirements. The developers must redesign the ground floor for a better presented and more commercially active southern side, as well as improving the interface with the existing hotel entrance. Staff parking must also be moved to the basement and any remaining spaces must be for short-stay commercial visitors or drivers with a disability. Fifteen parking spaces on the northern side of the basement’s first level must go, to allow room for tree planting on Macarthur Avenue, while the groundfloor landscaping needs to be redesigned to reduce the amount of paving and to increase planting along Northbourne Avenue. The developers will need to plant super advanced trees with a minimum mature height of 12m along both the Northbourne and Macarthur Avenue frontages. Balconies will need more screening and measures will need to be taken to limit overlooking between the existing Edgeworth apartments and the western façade of the new development. The developers will also need to resubmit traffic studies after the planning authority queried their conclusions about queuing and delays along Macarthur, Wattle and Dooring Streets. A minimum two-metre concrete footpath (Active Travel Route) will need to be built along Macarthur Avenue. The developers will also have to submit a revised Noise Assessment Report and Accessibility Report, as well as a Waste Management Plan. The Conservatore of Flora and Fauna opposed the development because of the loss of a regulated tree but it could not be saved. Not exactly a landmark by any stretch of the imagination - try again. This is the nation’s capital, not Wollongong. Please international architect community - help this city before it’s too late! !